Check out our last minute Weekend Ski Specials for great savings! Vacation rental house. Sleeps 12, 5 bedrooms, 3 bathrooms. No pets allowed. This Dollar Point vacation rental is a 3000 sq. ft. home that features five bedrooms and three bathrooms and will accommodate up to 12 people comfortably. The sunny great room and dining area open onto a large private deck that has recently been upgraded to have ample room for the entire family. There is a wet bar in the living room next to the massive rock wall wood burning fireplace. The kitchen is open to the dining area and is fully equipped for all of your cooking needs.. Downstairs is an area that has been converted next to the garage as an additional room/den that has a foosball table, Queen bed and TV area. On the main level you will find the master bedroom just off the entry, which has a Queen size bed its own TV and bathroom. Down the hall are two guest bedrooms, one with a Queen size bed and the other room with two Twins. Upstairs there is an open loft with a full size pool table. There are also two bedrooms on this level one has a Queen size bed and the other is a “bunk” type room with two Twin beds and a Queen bed. The bedrooms on this floor share a common bathroom. Wireless internet is provided along with blue tooth surround sound in the great room for use on tablet or phone. 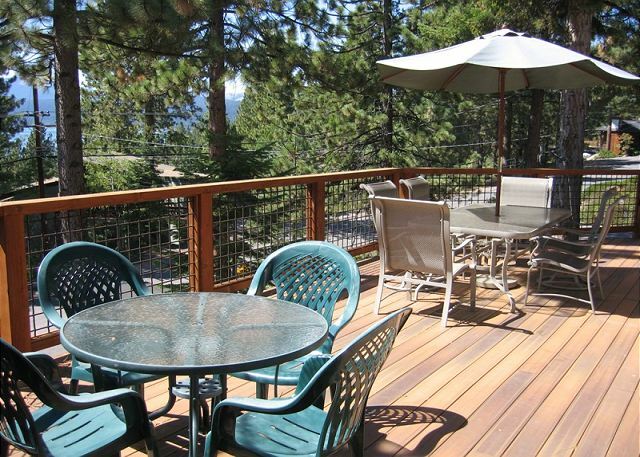 You will truly enjoy the lake views from this wonderful Tahoe vacation rental homes newly remodeled deck. Amenities include the Homeowner Association pool, tennis courts, large children’s' play area and beautiful beach with pier. 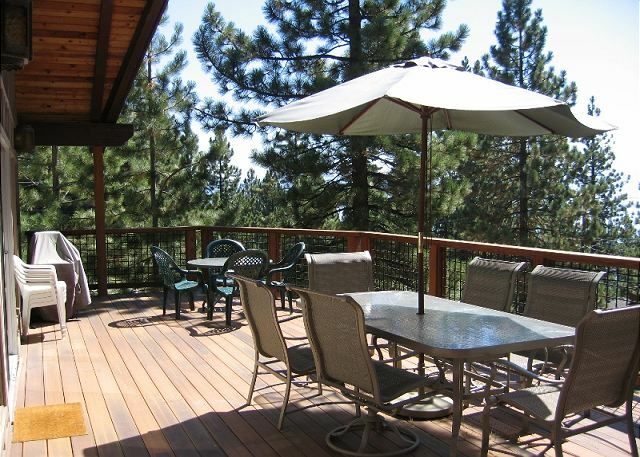 It is close to Alpine Meadows, Squaw Valley USA, Northstar at Tahoe and many other mountain resorts for winter guests. Great cabin overall. Mike, Heather + team were great to deal with. Very spacious and plenty of room for guests. Solid location as well. Highly recommended, there's more space than you'll know what to do with. Great space. Kids enjoyed a lot. Quite relaxing . We had a great week! The house was clean and spacious. (the deck needs renovation) We enjoyed the beach and swimming pool. Every aspect was enjoyed by the family. Thanks for your agency in our vacation! We love this cabin and have rented it several times. Ready to rent your property? We can help! Vacation Tahoe is a division of O’Neal Brokers. Our staff is comprised of professionals offering a full range of real estate services: residential, commercial, business sales, and rental property management, including homes, cabins and condos.